Recently, my 10-year-old grandson and I were looking at the various different science fiction films and television offerings from Netflix. 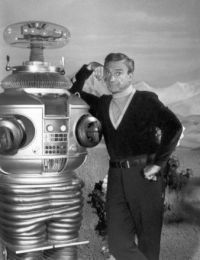 As we were looking, we ran across the 60’s television series Lost in Space. I told him how I watched the program every week while it was on. He asked if we could watch a couple of episodes, and so we did. To boldly go where no man (one) has gone before! What struck me at that moment was that our society today is much more like the crew on Lost in Space, then the crew of Star Trek. As individuals and as a society, we are lost in fear, overwhelmed by uncertainty, and desperate for safety. In just the last month, my personal encounters, as well as the news media, have placed an exclamation mark on this perspective. Personally, I listened to a 35-year-old single mother afraid of losing her children in a custody battle with her ex. I spoke with a 65-year-old man who fears he is going to lose his home because he has been unable to find work in the last four years, and he is almost out of savings. I spent time with a 17-year-old Hispanic girl who is afraid her father will kill her because she told one of her teachers that he had been sexually molesting her since she was 14. I shared a cup of coffee with a 60-year-old grandmother who feels rejected by her 40-year-old son who hasn’t spoken to her in over seven years, and has never seen his three children. As a culture, we fear our government, as well as one another. As the number of mass shootings grow (as I write this, another school shooting has taken place near Portland, OR), some gun rights activists are openly carrying AR-15s in stores and restaurants, and shooting galleries are rapidly growing in number around the country. We fear our government invading our privacy by gathering information from our computers and our phones, and we no longer believe that those who govern have the best interests of its citizens at heart. As the number of unemployed and underemployed solidifies at levels never seen before in this country, local communities and businesses fear the growing homeless populations will run off customers and tourists. Various institutions within our culture respond to this fear and anxiety with solutions that are black and white. Much of American “evangelical” Christianity says that the source of our fears is disobedience of God’s laws, repeating over and over again that homosexuality is a sin, marriage equality is defiance of God, that abortion is murder, and that our nation lacks “Christian” leadership. Law enforcement says we need more police on the streets, more technological tools, and broader powers to stop the violence that racks many of our major cities. Politicians tell us our government is wasteful and that programs need to be cut in order to bring our financial house to order. In the process, programs established to assist those in poverty are cut dramatically and in some cases abolished completely. This fear-based polarization has created an inability for our nation to come together under agreed-upon causes or visions that would bring about greater cohesion and community. Instead, our fear of losing status or power and control is driving us further and further apart—whether it be family, neighborhoods, or society. As individuals and as a nation, we have become lost in our fears with no vision for a future of inclusiveness and connection. We have become transfixed on the warning of the robot—danger, danger—than seeking out new worlds and new civilizations on the planet that we inhabit. Several years ago, I heard an interview in which the person being interviewed talked about the lack of vision in our society today. He harkened back to President Kennedy’s vision of going to the moon and how the nation rallied behind that vision. He recalled the rationing of various commodities during World War II, and how people embraced doing their part to help win the war effort. He went on to talk about the lack of ideas and imagination in our society, and when new ideas do come to fruition it is usually in the private sector and the focus is on making money. He ended the interview by saying that our lack of vision as a nation would be our downfall, and that we may have even passed the point of no return. The ancient Biblical writer said in Proverbs that without a vision the people will perish. One of primary roles of depth psychology today is to facilitate and bring to fruition a vision of inclusiveness and acceptance—for individuals, families, communities, and nations. Without such a vision, we and all that we have stood for as a nation will be lost. Schneider, K.J. (2013). The Polarized Mind. Colorado Springs, CO: University Professors Press.